Just try talking about an issue of substance in front of your kids. If they’re like mine, they dig right in with questions and opinions. That’s what makes dinner table conversation so lively. No surprise, research says that family discussions about current issues boost kids’ reasoning and mathematical skills. Unlike more casual chats, conversations about social and political concerns help kids make sense of big concepts including numbers. That’s because parents tend to give examples, use real life mathematics, and ask children to think for themselves. In our house, family blather often includes topical issues but the study reports very few of these conversations are taking place between kids and parents around the world. In the 41 countries studied, they happen less than once a month for 58 percent of children. Interestingly, the impact of family conversation is greater in more affluent countries where young people are blessed with the resources for learning such as books but have less time with their parents. In these countries more family involvement makes a striking difference in learning. The study’s author suggests talking to kids about oil spill volume and asking them questions about clean-up methods, but there’s no need for a despair-laden quiz session. 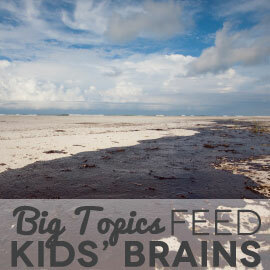 Open-ended discussions can translate to areas of interest to children. Often such conversations naturally touch on the math, science, history, and ethics of any concern society struggles to resolve. The big issues don’t have easy answers but they do make great topics, even if we talk about them around the table while still chewing. Thank you! I thought maybe we are just weird parents-but no! We have discussed real world issues with all of our kids. I am finally coming to the conclusion I need to homeschool our nine year old. Public school is failing him, in my opinion. He is bored to tears(literally!) in the classroom. Children are not drones. Children should love to learn new things,not dread getting up in the morning, Monday through Friday. They can handle big ideas and should be encouraged to do so. Thank you, again! Some of my kids most meaningful learning comes from discussions with my husband. My husband has a great mind and really probes the children more than I do. Sharing ideas and questioning things can really expand minds.